Somewhere between YouTube, Twitter and Instagram, Vine is the perfect platform for sharing. 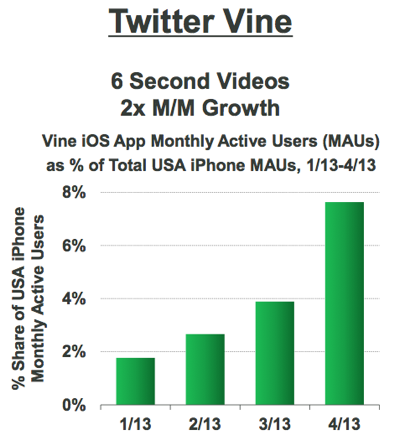 Vine’s monthly active user base soared from 2% to nearly 8% of iPhone owners in the U.S. between January and April. According to Onavo, Vine’s engagement growth in May is far faster than that of WhatsApp, LinkedIn, Chrome, Snapchat or other rivals. As a matter of fact, Vine’s engagement growth is more than seven times faster than Snapchat’s. Every college uses social media to engage with students and alumni. Apps like Twitter and Instagram paved the way for quick, visual snippets of information. Vine is a new way to communicate, and a number of schools are testing out the new medium. Here are a just a few of them. Editor’s note: Vine’s search function is limited. As a result, so is our list. Please leave a comment if you would like us to include your college on this list.